What a cute little chap he is, all nice and cuddly, not really, this guy got his common name because he was erroneously believed to have been one of the plagues of ancient Egypt. In fact this species came from the tropics and reached Europe in the early parts of this century. It is completely dependant on heated houses, hospitals, laundries and the like. Just like native ants, these also live in colonies, but in contrast to most other species there are sometimes several other queens in each colony. Female Pharaoh ants can lay 400 or more eggs in her lifetime. Most lay 10 to 12 eggs per batch in the early days of egg production and only four to seven eggs per batch later. At 80°F and 80 percent relative humidity, eggs hatch in five to seven days. The larval period is 18 to 19 days, prepupal period three days and pupal period nine days. About four more days are required to produce sexual female and male forms. The entire life cycle takes about 38 to 45 days depending on temperature and relative humidity. Unlike most ants, they breed continuously throughout the year in heated buildings and mating occurs in the nest. A single queen can produce many hundreds of workers in a few months. Mature colonies contain several queens, winged males, sterile females or workers, eggs, larvae, prepupae and pupae growing to as large as 300,000 or more members. Periodically a queen, together with a few workers carrying immatures (eggs, larvae and pupae), leaves the nest and sets up a new colony elsewhere, quickly spreading an infestation. This behavior pattern is known as "satelliting," "fractionating" or "budding" where part of the colony migrates to a new location rather than by single females dispersing after a reproductive swarm. Budding may occur due to overcrowding, seasonal changes in the building's central heating and cooling system or application of a repellent pesticide. Nests are often so small it can be contained in a thimble, located between sheets of paper, in clothing or laundry, furniture, foods, etc. Nests usually occur in wall voids, under floors, behind baseboards, in trash containers, under stones, in cement or stone wall voids, in linens, light fixtures, etc. They prefer dark, warm areas near hot water pipes and heating tapes, in bathrooms, kitchens, intensive care units, operating rooms, etc. They are "trail-making" ants and often are found foraging in drains, toilets, washbasins, bedpans and other unsanitary sites as well as in sealed packs of sterile dressing, intravenous drip systems, on surgical wounds, food and medical equipment. Pharaohs ants are virtually omnivorous with an affinity for feeding on sweet substances, but they also like cheese, dead insects, carrion and high protein foods such as blood etc. This is why they can be dangerous in hospitals, as they can carry various types of diseases because they penetrate beneath bandages and dressings and can even find their way into sterile packs. 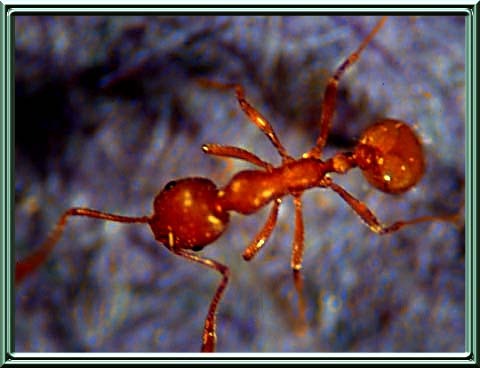 Below is a picture of pharoahs ant on sugar loaf. They are usually spread from place to place by the introduction of materials which are infested rather than the establishment of a new colony. When insecticides are prohibited around high-tech equipment and in health areas, use sticky tapes, double-faced adhesive tapes and masking tape (glue side out) wrapped around objects as barriers. Use a ring of petroleum jelly, non-hardening glues, sticky dust mats or glue boards under equipment legs. Seal cracks and voids with caulking compound after applying low residual repellent insecticides such as chlorpyrifos (Dursban) or Diazinon. In areas of active colonies, treat walls and ceiling voids through cracks and crevices with non-repellent boric acid dust and make bait placements. Keep the ants in the area long enough to get the slow-acting toxicants to the main colony where the workers, larvae and queens are poisoned. (A delayed action stomach poison is recommended.) Repellent insecticides, such as pyrethrins, will move the colonies, spreading them further throughout the building. Research has shown that it is best to use bait placement only where active ant trails are found. This assures feeding since some ants have not been able to find the bait when only one inch away from the bait stations. Intersect the ant trail with bait on a cotton swab taken from the station to ensure instant feeding. Bait preference may change during the season due to changing needs of the developing colonies. An effective bait is a 99 percent boric acid formulation mixed at a 5 percent concentration by weight in mint apple jelly (about two level tablespoons of powdered boric acid per 10 ounces of mint apple jelly). Another bait is 2 percent boric acid and 98 percent light corn syrup. A commercial bait called methoprene (Pharorid) is marketed for use by pest control operators in a bait that consists of liver, honey and sponge cake. 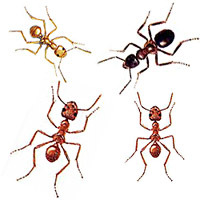 It is often difficult to use the bait ants prefer; as ants feed on one compound, another compound placed less than 1/4-inch away will be ignored until the ants spill over into the second bait. Boric acid and methoprene baits work slowly, sometimes taking 15 to 40 weeks or more before ant eradication. A bait, containing hydramethylon (same as in Maxforce roach bait stations) gives quicker results, 2 to 35 days, according to certain pest control operators. Bait stations may include jumbo size plastic drinking straw sections, medicine (pill) dispensing cups, plastic vial caps and/or drafting (masking) tape. Placement can be made on the rear lip of kitchen counters, at plumbing pipe-wall junctions, on window sills, behind wall electrical outlets, above door frames, etc., in less accessible areas of pets or young children. There may be increased or new ant feeding activity during the early part of the baiting program. No other pesticides, heavy-duty cleaners, or paints should be used during the baiting periods to discourage ant feeding. Applications of bendiocarb (Ficam), which is odorless, can give fast eradication of Pharaoh ants if treatments are thorough. Ficam 76 percent WP and 91 percent dust are labelled for licensed commercial and pest control operators. The bait products most recommended for Pharaoh ant control include: boric acid plus mint apple jelly (Drax), hydramethylnon (Maxforce), methoprene (Pharorid), bendiocarb (Ficam), propoxur (Baygon) and sulfluramid (Pro-Control). After bait stations are placed, one will see ants trailing to and from these bait stations. Do not spray or disturb the ants or bait stations. 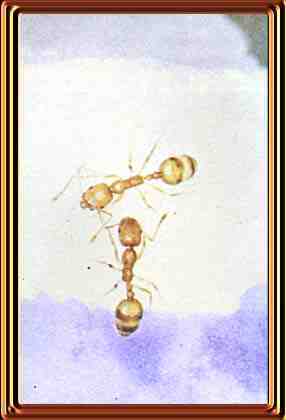 Ants must be allowed to carry the bait back into their nest where the active ingredient in the bait will eliminate the colony. Usually, Pharaoh ant control is best achieved by a licensed pest control operator or applicator who is trained, experienced and has the proper equipment. Before using an insecticide, always read the label, follow directions and safety precautions. As stated earlier, the treatment of pharoahs ants is a professional task. This is because these type of ants trail but it can be difficult to find the trails, therefore it can be difficult to trace the nest. One of the best ways of eradication is baiting with liver which has been mixed with a juvenile hormone which when taken back to the nest will prevent the ants from attaining breeding maturity. This type of treatment must be carried out to a set program, and therefore it is not adaptable for householders to carry out themselves. This can also be a costly task as the baiting program can last for many weeks, if not months depending on the degree of infestation.